My grandmother Wendy pulled out these old negatives at dinner a few weeks ago, and we sat holding them up to the light and talking about them. She's since had them developed, and gave me the CD of the digital copies. There are 34 photos, not all in very good states of visibility, and they range from the late 20s to the early 40s, we have decided. I'm sharing some of the best and clearest ones today. 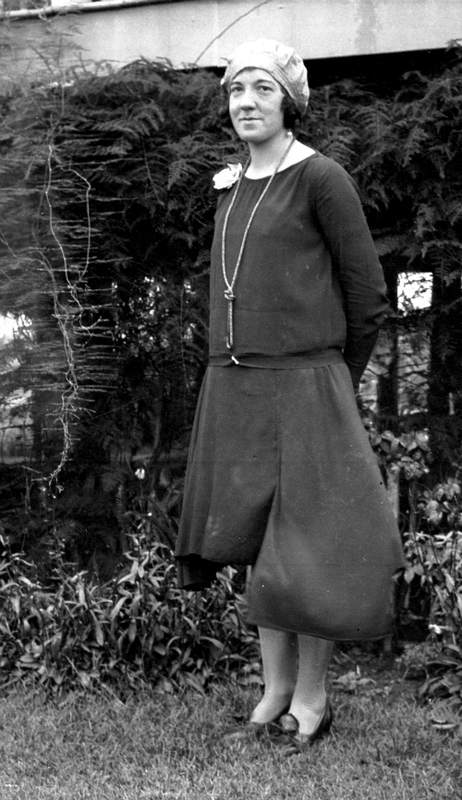 Here's my great-grandmother, Dora. She was a lovely woman when I knew her, who went through about half a dozen different craft obsessions in the last decades of her life. She was always active and busy. 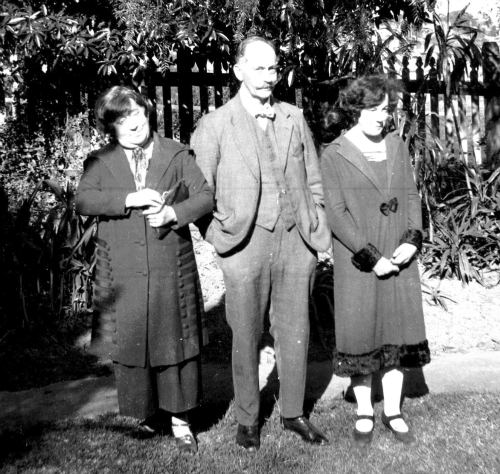 These are her parents, my great-great-grandparents. 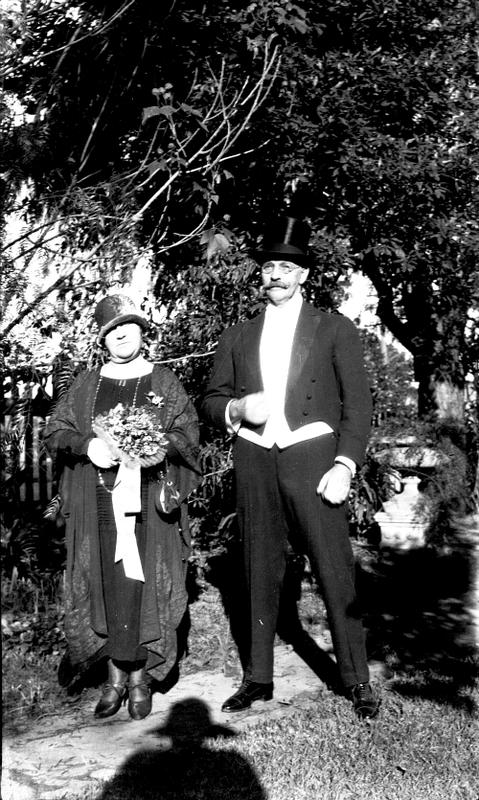 Dressed up for the wedding of one of their other daughters. 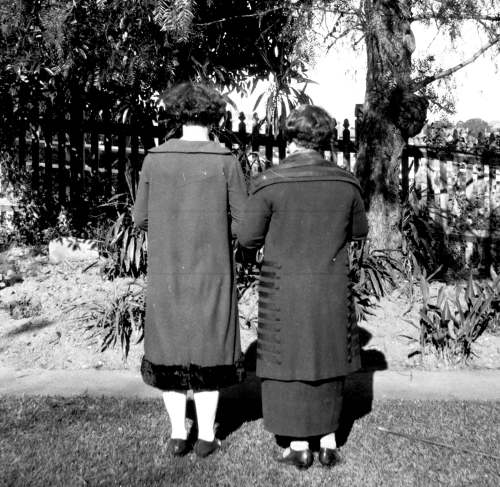 I love the photographer's shadow (it appears quite a lot in the whole collection!). 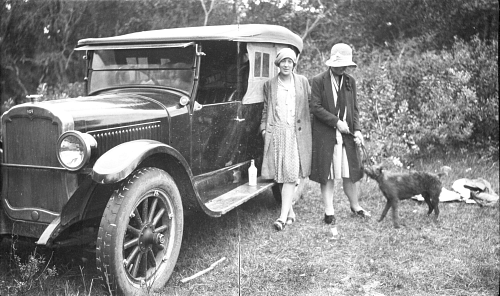 Dora and one of her sisters with their dog. I feel that the dog has interrupted the posing going on here! I love some of the details on these coats. And clearly they did too! Dora again. 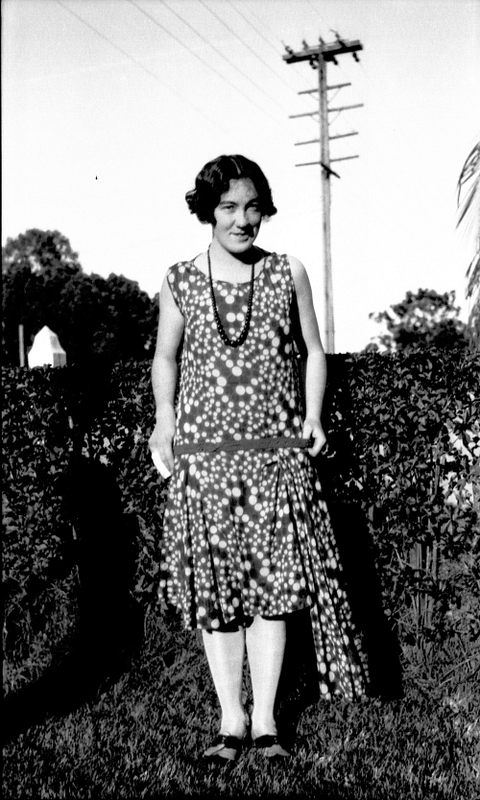 Apparently she loved dresses with "floating panels". Quite possibly from the same pattern as the one above. I wish I could get a better look at this hat! It definitely has something good going on! I love the semi-posed, semi-casual look here. I'm pretty sure, however, that Jim Henson made that dog. What a crazy face! There are stacks more negatives, so over time I hope to share some more with you. 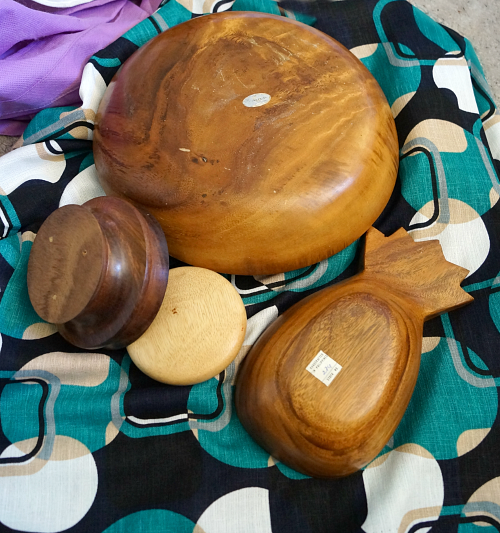 Some of the City Park club joined me for an op-shop (and vintage shop) crawl through Wagga. I bought a lot of things, including more shorts and singlets for the rest of the week in the Wagga heatwave! 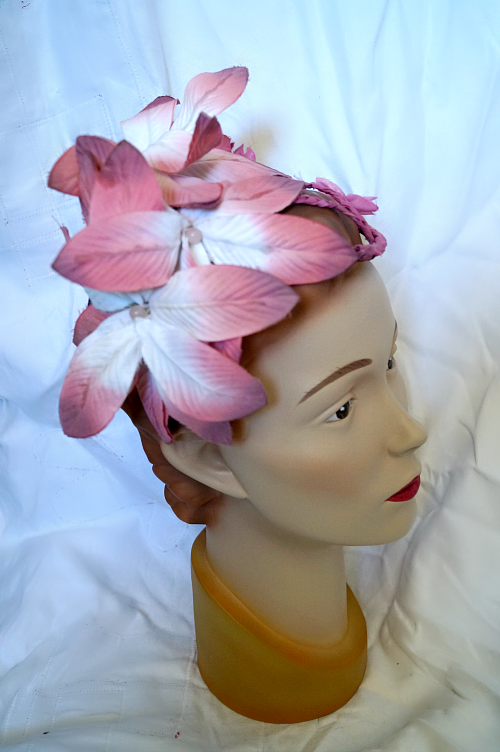 Also a dress for the Gala Dinner, and a bunch of artificial flowers to turn into my headpiece for said gala, and some fun crafty stuff for later. I love buying wooden bowls to try blocking on. Pretty excited to try the pineapple, although it may turn out to be a terrible idea! This class was a good one for me. 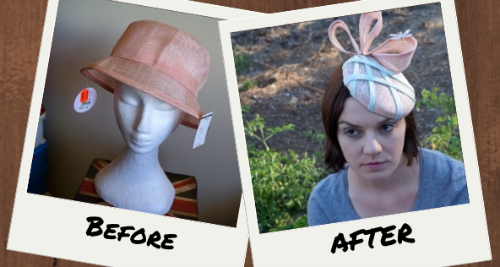 While I had done similar work before to some of what we covered in class, I learnt better and neater ways of doing it, and Jo-Anne talked a lot about what techniques were actually used in vintage hats. 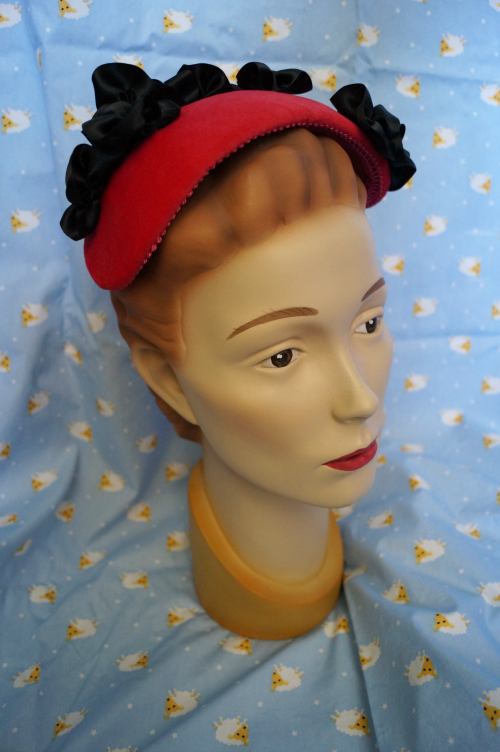 We made a 1950s style demi headpiece and started to learn about ribbon work. But perhaps most critically I felt a connection when Jo-Anne spoke about vintage style. About how it was often more subtle than modern racewear. About how hats complemented the dress, the hair and the person, rather than taking centre stage. And I knew: this is my style. This is where I belong. Lots of other things during the week made me certain that vintage, and vintage-inspired modern wear, is where I want to focus, but this class was the main wake-up moment for me. 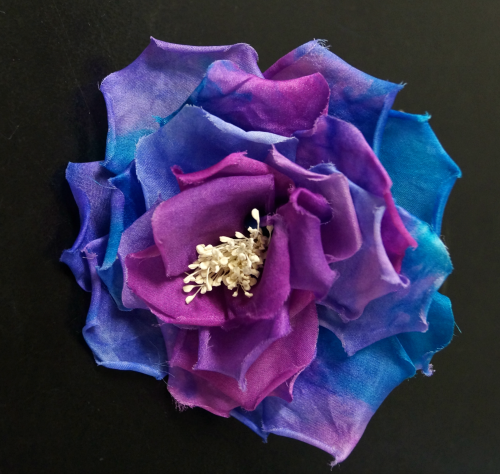 This is still currently pinned as I play around with the ribbon flowers. 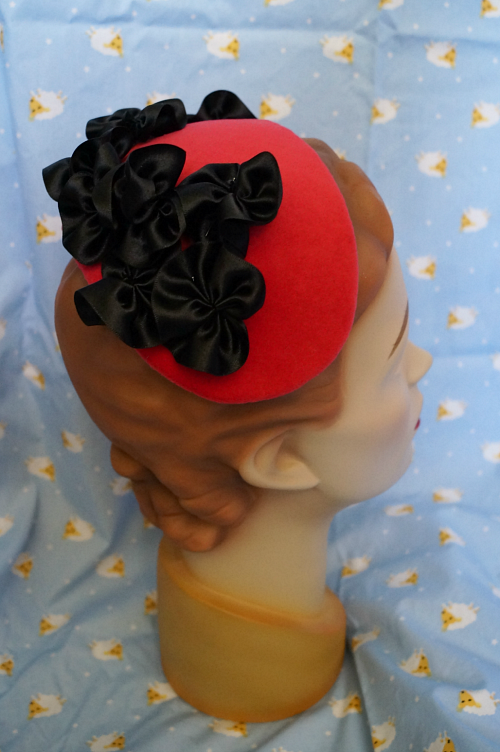 I like the cherry and black combo, but I'm still thinking about trying some different trims too. Jo-Anne Rolfe is based in the Riverina district of NSW and her website Vintage Designs features not only her stunning hats, but some beautifully styled photography. I've been taking apart some straw braid hats then procrastinating about putting them back together, so it was awesome to learn what to do (not just from a book) and get some practise and advice. 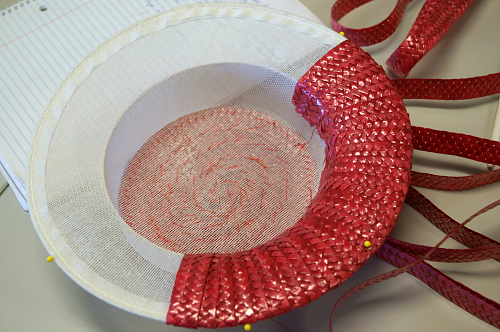 Jan showed us a range of different ways to attach the braid for the tip, sideband and brim. I knew I wanted to try the spiral sometime and expected I would find it tricky so I stuck with that in order to get Jan's help while I could! Later I'll try some of the weaving styles - they looked fabulous! For the brim I went with strips radiating out from the crown, and covering both sides of the brim. I think this is the easiest option and avoids having to worry about the edge of the brim at all! This one is also still unfinished. The sideband is waiting to get a fabric band when I decide what colour I want to go with the pink. Any ideas? 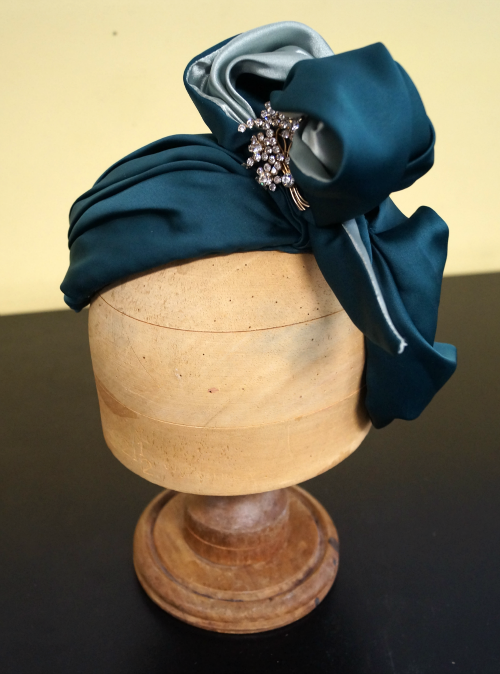 100+ milliners from beginners to world-renowned in one room, frocked up and wearing hats? Eye candy aplenty! Having said that, I don't want to share photos of others in case they are uncomfortable with that, so you just have to look at mine! The theme was Aussie summer, and I only picked out my dress ($15, thank you Red Cross shop) on Wednesday, and sad old dusty bunch of flowers ($1, thank you Vinnies) to match some of the colours. Thursday night became sewing night. 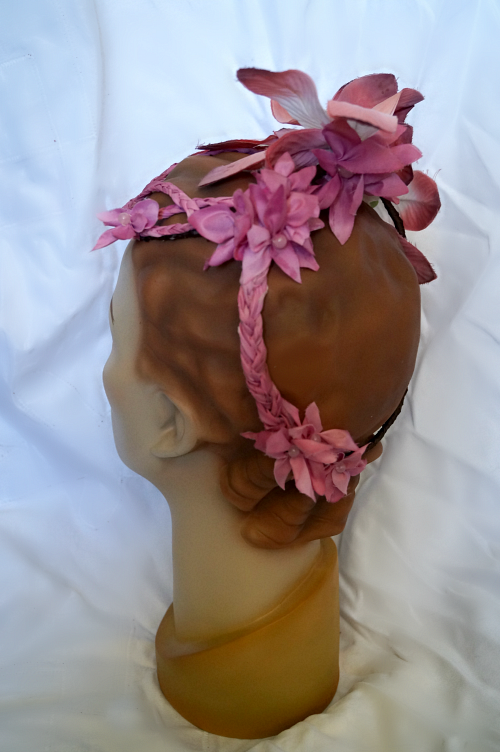 After complete deconstruction and washing of the flowers, I used what I learned in Mondays class to do a floral garland on a figure-eight base. The photos from the night weren't the best, unfortunately. I suppose, like most of us, I prefer photos that don't involve me! 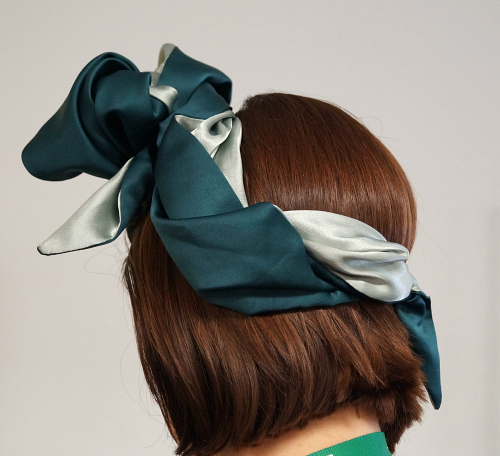 But in this case it is a shame, because the ribbon-wrapped wire doesn't blend into her "hair" the way it does into mine. But you get the idea. Naturally I forgot to get a "before" photo of the flowers, so you'll have to take my word for what a transformation it is. What a fabulous week it was. Thank you to all my tutors, new friends, the organisers, and the CWA for keeping us so well fed. Tomorrow the school term starts up again (for teachers) and I will not be there. 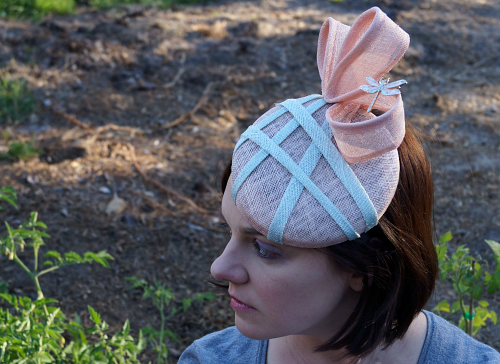 It marks the first official day of my leave and therefore the first day that I consider myself working as a milliner on my own small business. I couldn't be much more excited! 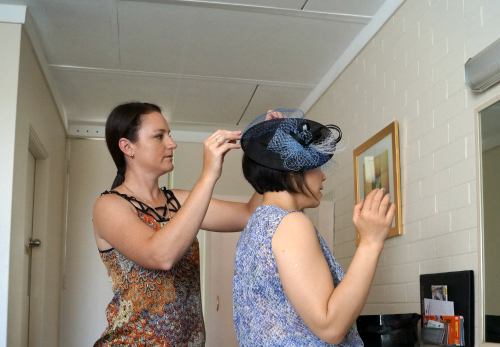 I'm just recovering from my week away at the International Millinery Forum in Wagga Wagga. This is the fourth forum, and my third. A week of intense workshops and events and meeting new people has left me frazzled and my mind whirring with ideas and revelations. The first two nights I could hardly sleep because my brain would not turn off (the heatwave didn't help either). The big thing that was different for me this time around was the social aspect. I previously stayed at a B&B (I'm not even sure why) but this time I stayed at one of the recommended accomodation options, and caught the shuttle bus in to the events. Consequently, I actually met people, made friends, and had a much better time. I also got to talk with the other milliners about their lives, their hats, and their businesses. I am full of good advice and a lot of encouragement. So much happened that even to summarise I'm going to take a couple of posts! Much money was spent. Many hats were admired. Impromptu hat-making party at the motel. Discovered I forgot to bring high heels, shorts, and enough clothing suitable for a full week's worth of temperatures in the 40s. In this class we explored alternate methods of attaching non-headsize-hats to heads, mostly 1940s techniques. We looked at examples, made samples of a few methods, then applied one to the hat that we brought. 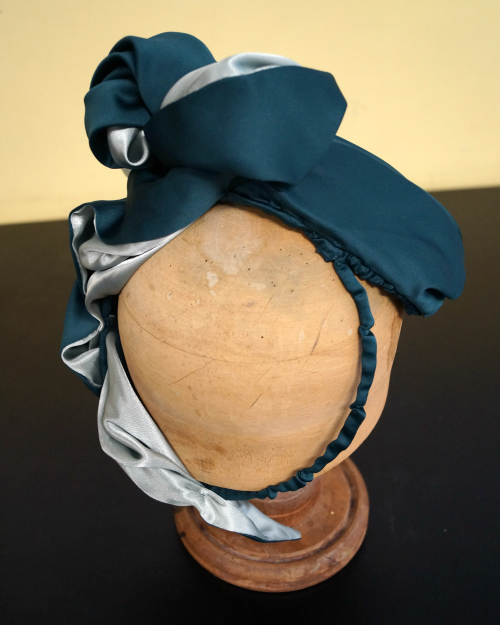 For me, that was the vintage-inspired draped silk hat. I brought the remains of the dress along and used up more bits to do the attachment. It really got me thinking about how my hats look from the back, and how to make all sides a feature. This was probably my favourite class in terms of the quantity of ideas I got from it. 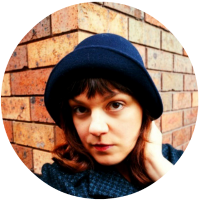 I love vintage-style hats, and this week has made me realise that is where my heart is. 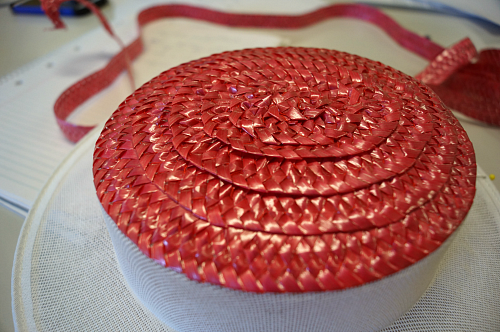 Waltraud's 3-hour class looked at making trims from a few different materials. 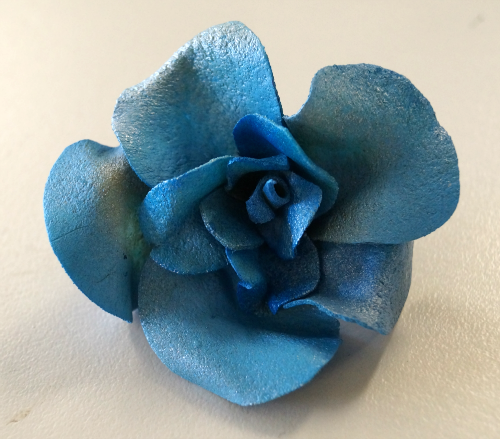 We talked about thermoplastic materials, and used Worbla to make a flower. We also played around with linen abaca but I didn't get anything finished. It was a lovely material to work with though, and I'm looking forward to experimenting more with it, and the rest of the Worbla. Another 3-hour class, at a frantic pace! We dived straight in and had dyed our silk in the first 15 minutes. Once it was dry, stiffened, and dried again, we cut and hand-rolled and attached our petals around these vintage stamens. By this time my brain was slowing down and my nerves were getting frazzled. Thank goodness for the day off on Wednesday! And some Big Bash League to watch from bed in the evenings! 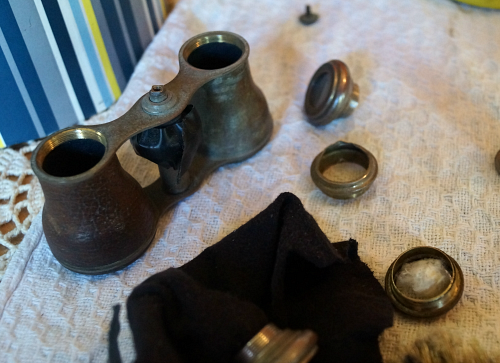 Some years ago, I was given a pair of opera glasses that had been passed down in my family. 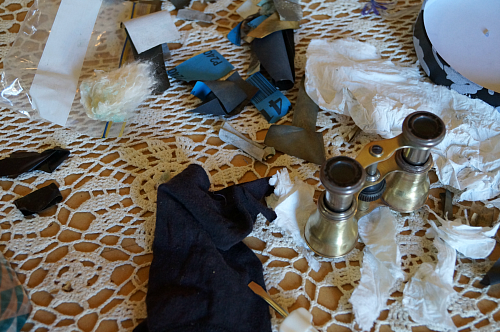 They were dirty and didn't really seem to work, and the leather covering was only left on one side. Thanks to my involvement in Wattle Flat Crafts, I met a leatherworker, Dan. 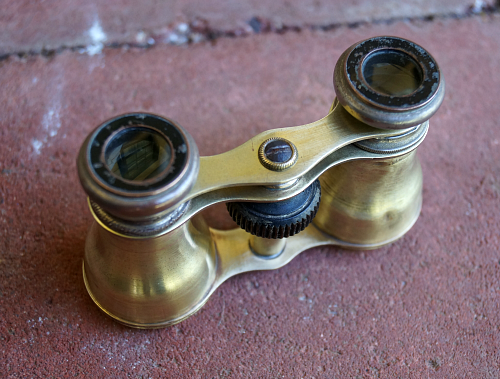 She spurned my offer to employ her to restore the opera glasses, insisting I could do it myself, and offered to help me. After a full day of both of us polishing grime, with more hours to come, I understood why. 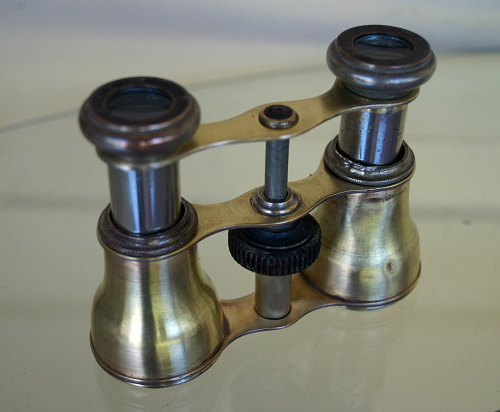 We took it apart as much as possible, cut off the remaining leather, sanded and polished away tarnish and muck, wiped the dust of ages from the lenses, inside and out. Dan even polished the tiny screw until it gleamed. 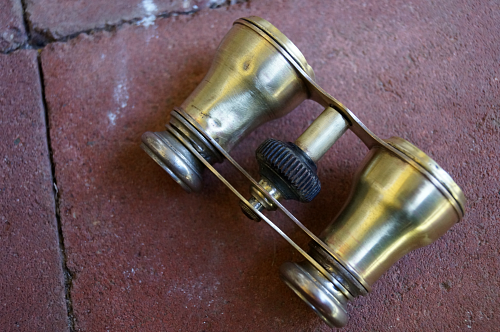 In the end, because the brass underneath has more shine to it than expected, I'm happily able to avoid the use of leather. The glasses, I now know, belonged to my grandmother's great aunt Maude. 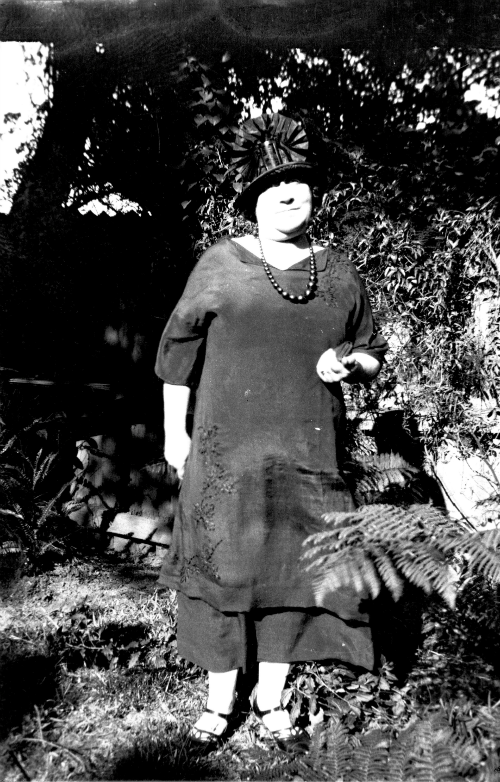 She was involved with an Italian opera singer, who used to go about in a cape and carrying a cane. 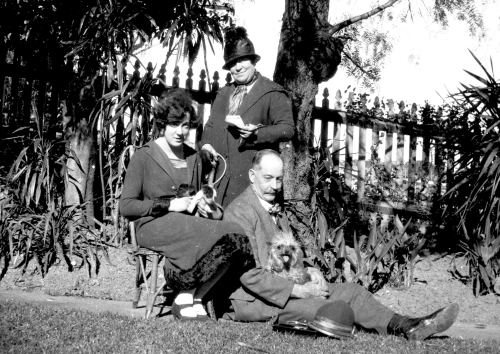 He sang with an opera company here in Australia, in a time when they travelled around in carriages, sets and all. He and Maude weren't married because he had a wife back in Italy. They are far from perfect, but they always will be. They have been through a long life, and been dropped a few times based on the dents! They move more smoothly now, and you can actually see through them. They still only make things appear about half a metre closer though. It's nice to see them shine again. I'm lucky (in some ways) to come from a family that never throw anything away! Do you have a family like that? What exciting treasures are you lucky enough to still have around? 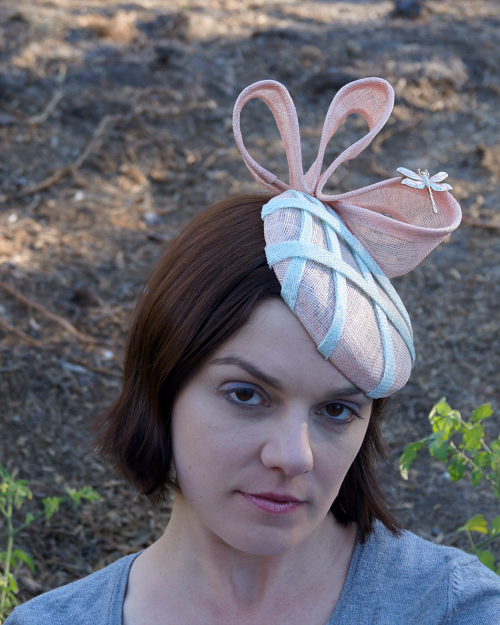 Today the sister hat to the blue straw and sinamay that I re-fashioned earlier gets its own time to shine. 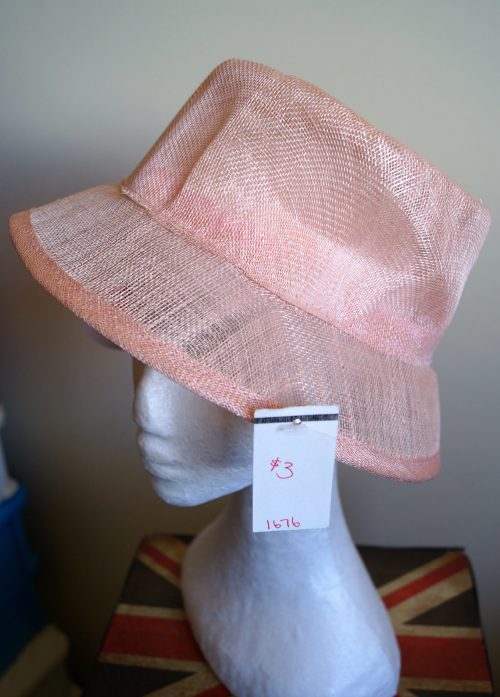 It began life as a pale pink sinamay hat blank in a Spotlight store somewhere. After being put on sale, it somehow made its way to an op-shop in Penrith, then came home with me to get a new look. Perhaps something less boxy? I think so. First, I pulled the crown and brim apart and re-blocked the crown. I had an idea of how I wanted to use the brim but I didn't know what else to trim it with, and what other colour(s) to introduce. So I rummaged through my bits and pieces until I found the answer. Now I had some colours to work with. I found some pale bluey-green sinamay left over from my first sinamay hat, made some bias strips and played around. In front of my dirt patch. I'm very proud of it. Actually there are some tomatoes there, looking quite promising. 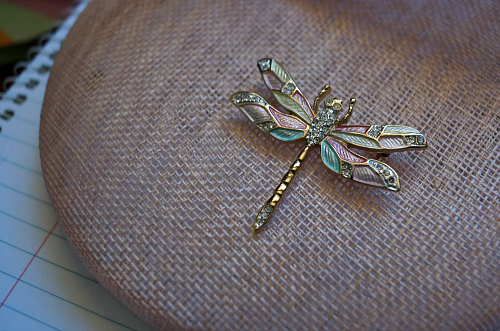 The dragonfly brooch came from a charity shop in Chester and cost me one pound. To keep the refashioning options open into the future, I kept it as a brooch and it can be removed (or just moved around) in the future. Time to hit the op-shops for more! If you've been to the blog recently, you will already have noticed the major visual changes in the last weeks. If not, look around! I have a new logo, by the talented, patient and understanding Leigh Tuckman. I know Leigh through my sister and some other friends we have in common, and my first view of her work was her travel posters for fictional places - Narnia, Wonderland and Oz. The fox is my little mascot for the playful mix of cute and sophisticated that I like to pursue in my work. Leigh has turned my red felt makeover and the red hat I made for Wendy into part of my logo and icons, which makes me so happy. I felt truly joyous seeing my own creations turned into illustrations, and I get a thrill from seeing them now on my site. I've kept the "Shop" button there in the sidebar for now, even though it isn't going anywhere just yet. 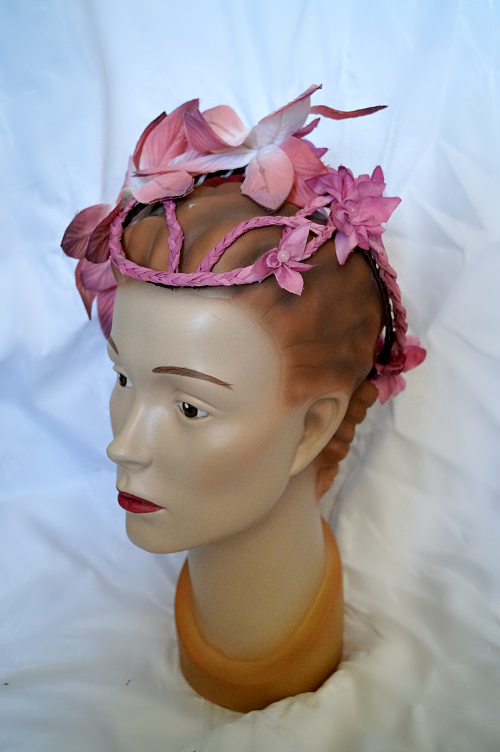 The planned opening date is January 20th, after I get back from the 2014 International Millinery Forum in Wagga. If you go to the Gallery, you'll see I've included some of my past work (and I'll add some more soon) to browse through. I'm trying out gallery software called Cincopa, which I'm enjoying so far, but I'm still playing with it. I like the "Pinterest-style" skin because it works so well with my photos and their vastly different orientations and dimensions. I've spent the "lost days" between Christmas day and New Year's eve learning about RSS feeds, joining Bloglovin' and Twitter and doing lots of reading on things I should probably have learned about ages ago. So I now have my snazzy little social media buttons courtesy of Love from Ginger (website no longer active) to make me look like I know what's going on in the world. Now, although I'm still considering myself "on holidays" from my old job and not yet "at work" in my new job, it's a mix of holiday stuff and hat-making. So, today was the cricket, tomorrow I've got some blocked sinamay bases to wire and trim!